A brief recap of our overall market here in Williamsburg VA.
Well, we have good news to report on the Williamsburg VA real estate market – We have reached a point of stability. 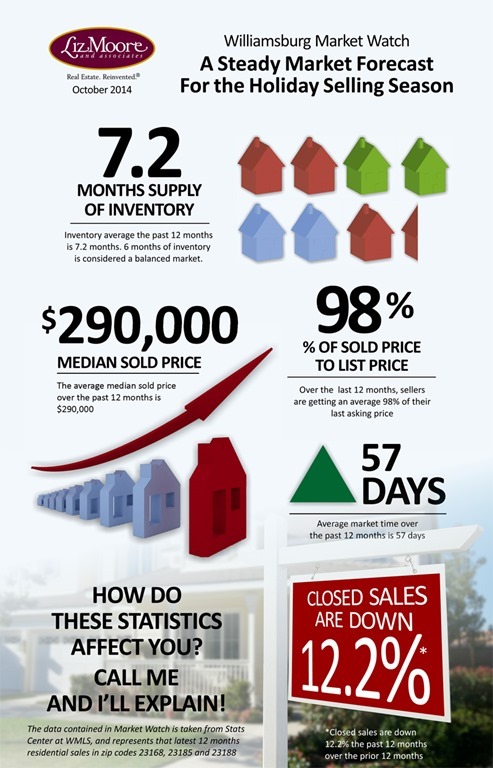 The average selling period for home sellers here in Williamsburg is 57 days. We are expecting mortgage interest rates to rise as we move into 2015 . Right now we have great rates so take advantage while you can because the Fed still thinks it will be a “considerable time” before it begins to raise interest rates. The Zero Interest Rate Policy remains in full force, as it has been since it began at the end of 2008. This policy will change because we cannot sustain this type of monetary policy as it just continues to add to our National debt. Plus, we need a market-driven interest rate environment and a more predictable monetary policy to help foster long term economic growth. This will definitely impact our housing recovery moving forward.